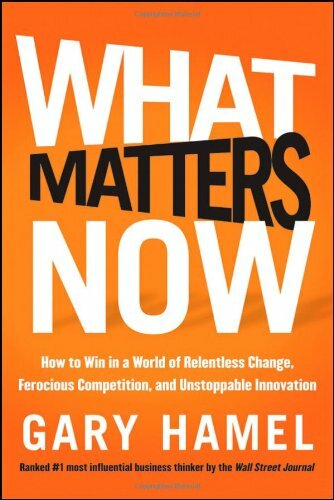 What Matters Now is Gary Hamel’s impassioned plea to rethink the fundamental assumptions we have about management, the meaning of work and organizational life. He asks, “What are the fundamental, make-or-break issues that will determine whether your organization thrives or dives in the years ahead?” The answer is found in five paramount issues: values, innovation, adaptability, passion and ideology. Values: With trust in large organizations at an all time low, there is an urgent need to rebuild the ethical foundations of capitalism. Innovation: Innovation is the only defense against margin-crushing competition, and the only way to outgrow a dismal economy. Adaptability: In a world of accelerating change, every company must build an evolutionary advantage. The forces of inertia must be vanquished. The ultimate prize: an organization that is as nimble as change itself. Passion: In business as in life, the difference between “insipid” and “inspired” is passion. With mediocrity fast becoming a competitive liability, success depends on finding new ways to rouse the human spirit at work. Ideology: Today, businesses need more than better practices; they need better principles. Bureaucracy and control have had their day. It’s time for a new ideology based on freedom and self-determination. Fealty: A propensity to view the talents and treasure at one’s command as a trust rather than as the means for potential gain. Charity: A willingness to put the interests of others ahead of one’s own. Prudence: A commitment to safeguard the future even as one takes advantage of the present. Accountability: A sense of responsibility for the systemic consequences of one’s actions. Equity: A desire to ensure that rewards are distributed in a way that corresponds to contribution rather than power. In recent years, left-brain types had the upper hand while starry-eyed innovators have struggled to get a hearing. Nevertheless, before innovation slips any further down the list of corporate priorities, we need to remind ourselves that we owe everything to innovation. We owe our existence to innovation. Our species exists thanks to 4 billion years of genetic innovation. Since time immemorial, life has been experimenting with new genetic combinations, through sexual recombination and random mutations. As human beings, we are the genetic elite, the sentient, contemplating and innovative sum of countless genetic accidents and transcription errors. We owe our prosperity to innovation. Most of us do more than subsist. From the vantage point of our ancestors, we live lives of unimaginable ease. Between the years 1000 and 1820, global per capita income rose by a scant 50 percent. Over the next 12 decades, it grew by 800 percent. Put simply, innovation rescued humanity from privation. We owe our happiness to innovation.Humans are the only beings who create for the sheer pleasure of doing so. Forget the Renaissance, the Enlightenment and the Industrial Revolution — ours is the golden age of innovation, and we should take delight in that fact. We owe our future to innovation. Today, humanity’s most pressing problems aren’t merely technological; they’re social, cultural, political, and global in scope. That’s why, like Thomas Edison, we must innovate around innovation. Luckily, there are new meta-innovations (like idea markets, crowdsourcing and folksonomies) that can help us innovate across disciplines, borders, institutions and ideologies. This is the only way we’ll solve the make-or-break challenges now facing our species. Our future, no less than our past, depends on innovation. All ideas compete on an equal footing.On the Web, every idea has the chance to gain a following, or not. Ideas gain traction based on their perceived merits, rather than on the political power of their proponents. Contribution counts for more than credentials.When you post a video to YouTube, no one asks you if you went to film school. When you write a blog, no one cares whether or not you have a jour- nalism degree. On the Web, what counts is not your resume, but what you can contribute. Hierarchies are built bottom-up.In any Web forum there are some individuals who command more respect and attention than others,and have more influence as a consequence. Critically though, these individuals haven’t been appointed by some higher authority. Instead, their clout reflects the freely given approbation of their peers. On the Web, authority trickles up, not down. Leaders serve rather than preside.On the Web, every leader is a servant leader; no one has the power to command or sanction. Tasks are chosen, not assigned.The Web is an opt-in economy. Everyone is an independent contractor and everyone scratches his or her own itch. Solving the world’s toughest problems or, more modestly, creating organizations that are deeply human will require more than scientific breakthroughs; it will require new ways of planning, organizing, collaborating, allocating, motivating and yes, controlling. As managers, we’re pragmatic doers, not starry-eyed dreamers. And yet, as human beings, we are ultimately defined by the causes we serve and the problems we struggle to solve. Though big problems don’t yield big advances, small ones never do. Ensuring That Management Serves a Higher Purpose. Tomorrow’s management practices must be focused on the achievement of socially significant and noble goals. Embedding the Ethos of Community and Citizenship. In tomorrow’s interdependent world, collaborative systems will outperform those characterized by adversarial, win-lose relationships. Humanizing the Language and Practice of Business. Tomorrow’s management pioneers must find ways of infusing mundane, commercial activities with deeper, soul-stirring ideals, such as honor, truth, love, justice and beauty. Mar 17 Things you need to book about the book "Speaking As A Leader by Judith Humphrey"